It all started when I was drawing up my grocery list and noticed that the only fruit remaining in the fruit basket was this lonesome chiquita banana, the peel almost covered with black spots, not too ripe but not something that my kids would want to eat. All I had to do was peel it and eat it and the story would be finished. But no! 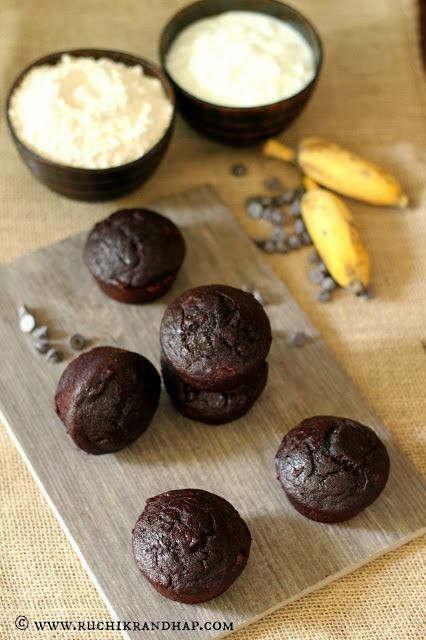 There is something about over ripe bananas that triggers this manic urge to bake with them. Why waste it when you can taste it I say! When life gives you lemons there are tons of things you can make with them, but when it gives you over ripe bananas the only thing you should do is bake some yummy banana muffins that are healthier because you replace refined flour with whole wheat, butter with coconut oil and throw in some yogurt for good measure! Add some chocolate chips and you can win the hearts of your little ones! 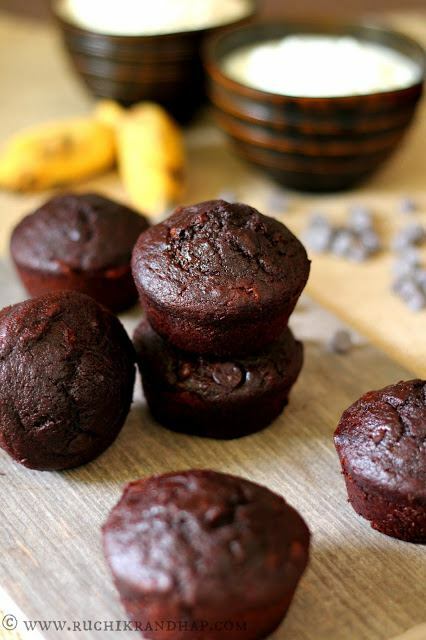 Psst!Thanks to the cocoa and choco chips that masked the strong aroma of bananas, the little ones gladly ate them without a fuss. If you are a crazy mom who likes to sneak in fruits & veggies into baked goodies for her kids then you know what I’m talking about. Since my son doesn’t like eating eggs in any form I like to sneak them into baked goodies so whenever I see over ripe bananas I feel like the whole universe is urging me to bake with them. Not only am I putting a good fruit to good use but I am also able to get my son to eat some eggs – by hook or by crook! To be honest, I ate up most of these muffins. I feel so guilty now! They just tasted so good! I never thought that muffins with whole wheat would taste so yummy and light! It could be due to the addition of cornstarch (cornflour) which is the secret behind what makes cakes fluffier if you use cake flour (yep! it contains plain flour plus cornstarch). Since I didn’t have any, I simply used vanilla custard powder (which is nothing but cornstarch with vanilla flavouring and some yellow food colour). This is a very forgiving recipe that way. You don’t have to fuss too much over the process. You can even taste the batter after you’ve mixed it and add more sugar if you like and mix it again. So basically, the recipe is very accommodating! 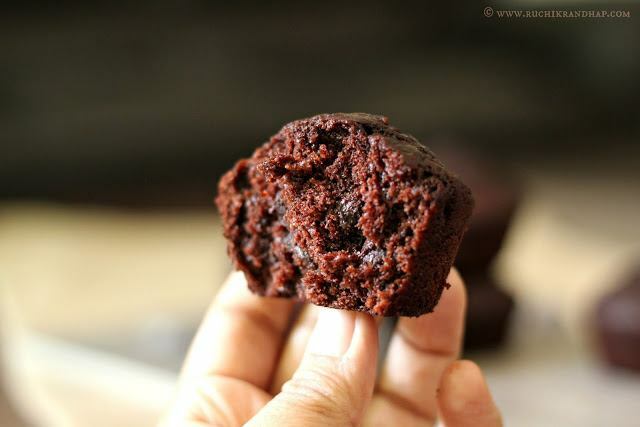 If you don’t like chocolate muffins, just replace the cocoa powder with some more flour. Retain the chocolate chips though – they are charming! 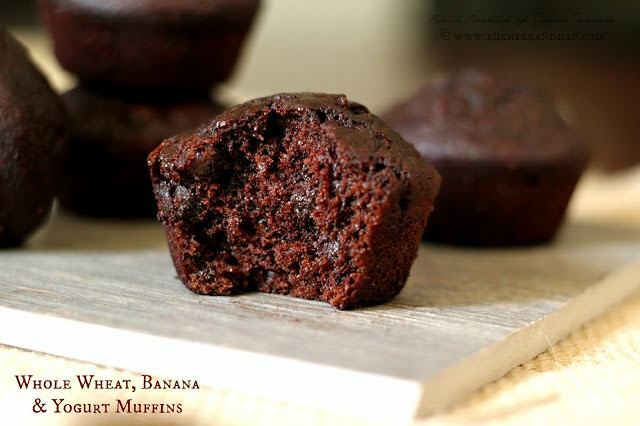 So the next time you have some over ripe bananas you know what to make! If you liked this recipe do drop me an email at ruchikrandhap@gmail.com or follow me on Facebook, Instagram, Twitter and GooglePlus and leave your comments! 2. In a bowl place the coconut oil and add the egg, whisk it well. Add the vanilla extract, hung curd and mashed bananas and mix everything well. 3. Sift in the whole wheat flour, cornstarch, cocoa powder, baking soda and salt. Add in the sugar and fold in the chocolate chips. Do not overmix. 4. If the batter is too thick, add the milk a little at a time till it loosens up. 5. Fill up the muffin moulds with the batter, about two thirds full and bake for about 18-20 minutes or till the skewer inserted comes out clean. 6. Remove from the oven and let them cool in the tray for 10 minutes. Then remove onto a wire rack and cool completely. Enjoy! 1. If you wish, you can use 1 cup mashed bananas and skip the addition of milk. 3. If you don’t have readymade chocolate chips you can coarsely chop your favourite bar of chocolate (preferably dark chocolate) and add it to the batter. 5. You can make hung curd by placing 1 cup of curds (yogurt) in a muslin cloth and hanging it over the sink for about 45-50 minutes. When the excess whey dribbles away you are left with very thick curd. would like to know what coconut oil u use?